Lock in a great price for Motel One Zürich – rated 8.8 by recent guests! Location was easy to reach from ParadePlatz. Nice pub next door. Very friendly stuff. The hotel is very well situated. The staff is friendly and helpful. The rooms are clean and comfortable. The decor is tasteful. It’s a great choice for a short stay. 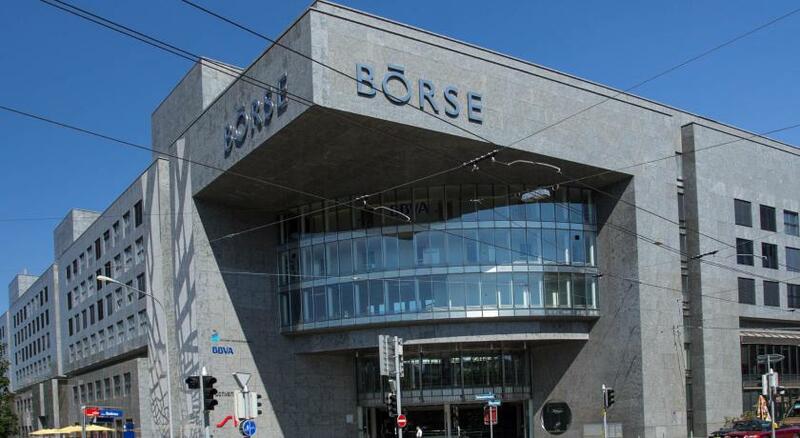 Centrally located in Zurich. The lake and Altstadt are within walking distance. Very clean, well priced, friendly helpful staff, and well located . Motel One Zurich did an amazing job of helping us celebrate our honeymoon to Switzerland! We really appreciated their kind touch making our room extra special and romantic. Motel One Zurich also gave us two drink vouchers to their 24 hour and congratulated us on our marriage. We were so grateful! The location of this hotel is wonderful! I only stayed one night, so being in a super walkable location made all the difference and allowed me to see more. Also, this hotel is about 15-20 minutes from the airport, depending on traffic. The staff was very friendly and the hotel has a nice bar. The quality we received for the price we paid was incredible. Pretty centrally located - roughly 5-15 min from all the bars/restaurants we were interested in since my friend and I were only in town for a night. Comfortable beds and a good shower as well as a decently spacious room overall. We didn't know it at the time, but two of our other friends were also staying in the hotel and said that the breakfast was fantastic. Would definitely recommend staying here. Really clean room, comfy bed, friendly staff and great location. Hotel is optimized for efficiency, everything is just straight forward. I really like this concept! The hotel staff is very welcoming. The beds were very comfortable. Great shower. The decorations and vibe in the bar are cool. Overall, great value for the money. Motel One Zürich This rating is a reflection of how the property compares to the industry standard when it comes to price, facilities and services available. It's based on a self-evaluation by the property. Use this rating to help choose your stay! Boasting a shared lounge and free WiFi, Motel One Zürich is located in Zürich. 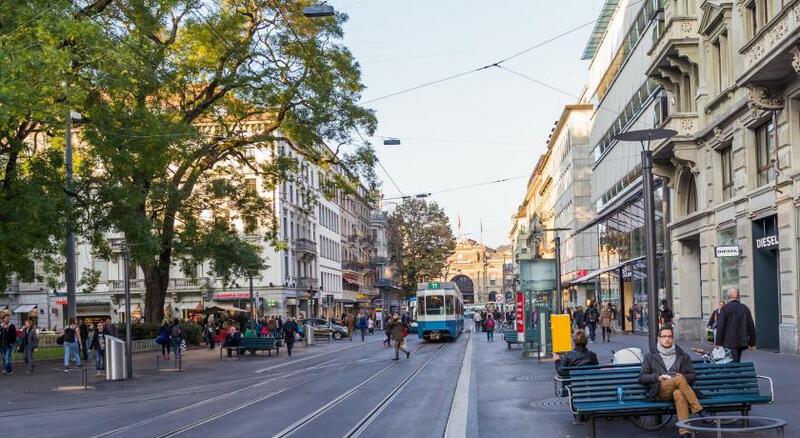 The property is around 1,950 feet from Paradeplatz, 1,950 feet from Bahnhofstrasse and 0.7 mi from Grossmünster. Rooms come with a flat-screen TV with satellite channels. 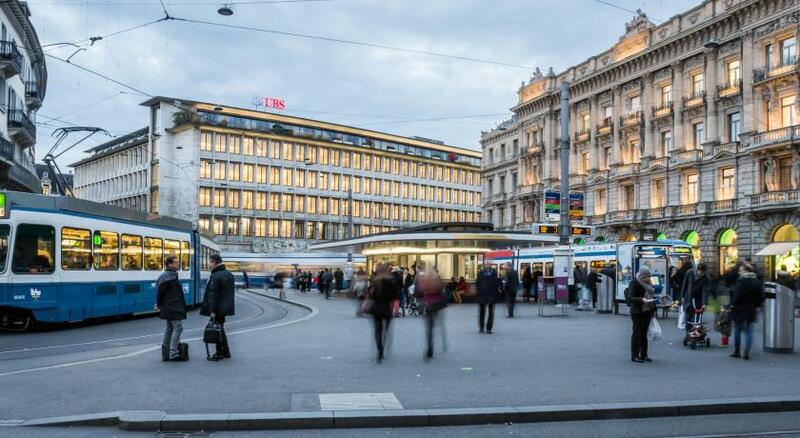 Zurich Opera House is 0.9 mi from Motel One Zürich, while Swiss National Museum is 0.9 mi away. The nearest airport is Zurich Airport, 7.5 mi from the accommodations. When would you like to stay at Motel One Zürich? House Rules Motel One Zürich takes special requests – add in the next step! Motel One Zürich accepts these cards and reserves the right to temporarily hold an amount prior to arrival. Please note that the full amount has to be paid upon check-in. Colour scheme, places to sit near reception. The location of the hotel is extremely convenient. The staff is friendly. The location of the hotel was perfect, especially the lobby and the bar was very well decorated and modern. It was a great choice for a short stay at the city center. Very dark interiors, super long corridors, far, far away from the elevator. Proximity of the rooms in front that feels so close like they are looking inside of your room. Shame we couldn’t get a light meal at night if wanted. Good access to everything, trams passed the door, but we walked to most places. Staff were really friendly!!! Real value for money for business trips. All the important sights / banks are in walking distance. Clean and renovated rooms. This hotel is described as "budget", but it is far better than that! Thye apologise for no phone in your room but we all have mobiles now anyway so who needs one? And no mini bar in the room, but there's a bar downstairs and a supermarket a minute's walk away, so hardly a hardship. The walk to the room is long,( I think I passed though Geneva along the way), but I found a shortcut down a service elevator and through the bar, so again no real hardship. Centrally located just a 15 minute walk or three tops on the tram to the main station. No obvious street entrance with ramp, dragged suitcases up the stairs. Bathroom door could not be propped open and could be better ventilated. Very clean, super comfortable bed, lovely helpful staff. We arrived ahead of the usual check in time but staff was very helpful in allowing us to check in early and get a room. They were also very helpful in providing information for a few things we wanted to do around the city. The room was very comfortable and clean!